Everyone knows about the Simbu Vaalu Movie release issues. 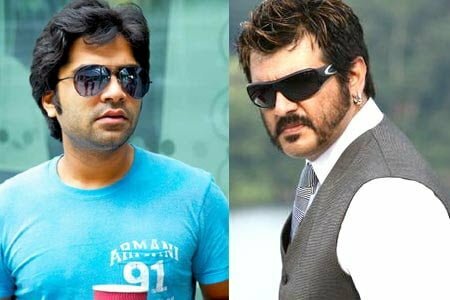 Although Simbu was an Ajith fan, Vijay helped him release the movie. T.RAJENDRAN was the most happiest to know about the release. He also has the majority of profits from the movie. The movie was made on a 20 crore budget and was stalled for nearly 3 years which is really sad. Simbu and his whole family keeps on wishing Vijay for the help he did, Everywhere they go. This was indirectly hurting Ajith since the hype was Ajith didn’t help his fan while Vijay helped him even though he was not his fan. Ajith was not happy about the speech given by T. Rajendran in Puli Audio Release. He mentioned that Vijay is a Tamilan and Simbu is a Tamilan and that’s the reason for the big help. He means that one Tamilan helped another Tamilan. This caused the Twitter fans to respond with false news that Ajith was a Malayali and that’s the reason why he didn’t help Simbu and Vijay was a Tamilan so he helped him. Ajith was not at all happy about this. It is said that he warned Simbu no to use his name or his movie names in any of his movies.